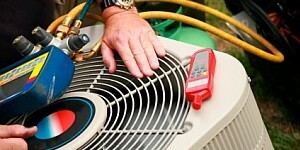 We specialize in air conditioning repair, heaters and commercial refrigeration for North Texas residents and businesses. We stand behind our work with a 100% satisfaction guarantee. We aren’t happy until you’re happy. Call us today at 903-821-5295 for a free estimate or to schedule a service call. After a few calls with no return replies and an no show from another highly recommended air conditioning service, a friend of mine recommended Blessed Air & Refrigeration Service. I gave them a call in the afternoon to fix our upstairs A/C system because it wasn’t cooling. They found a leak in a pipe which a different company had missed just two months prior. I am SO happy that we have a cool upstairs now! They came out that same day I called and I just got word that another friend of mine I recommended them too is also very happy with their service. They even called us the next day to make sure it’s working well and cooling us down! Very Happy. Having gone through multiple repairs for the same problem with another AC repair service, I decided to find a new company to fix the problem. Blessed Air & Refrigeration Service was able to not only immediately locate the problem but provided top notch service at an affordable price. The problem has been fixed permanently. I’ll be using your company for all my air conditioning repairs in the future and recommending them to everyone I know in North Texas. Thank you!